MSA Safety have launched their simplified range of safety harnesses and self-retracting lifelines that offers its customers the full circle of fall protection solutions from engineered lifelines to permanent guard rails and full body fall arrest harnesses. The V-Range is named after the iconic V-Gard® safety helmet developed by MSA in 1962 and trusted by millions of personal protection users across the globe. The range, when used in conjunction with MSA’s Latchways® engineered lifelines, offers the highest specification of fall protection available on the market. Two types of harness with the V prefix will be available to offer customers a comprehensive choice. There will be a lightweight and durable V-FORM™ and a padded and tailored V-FIT™ option. 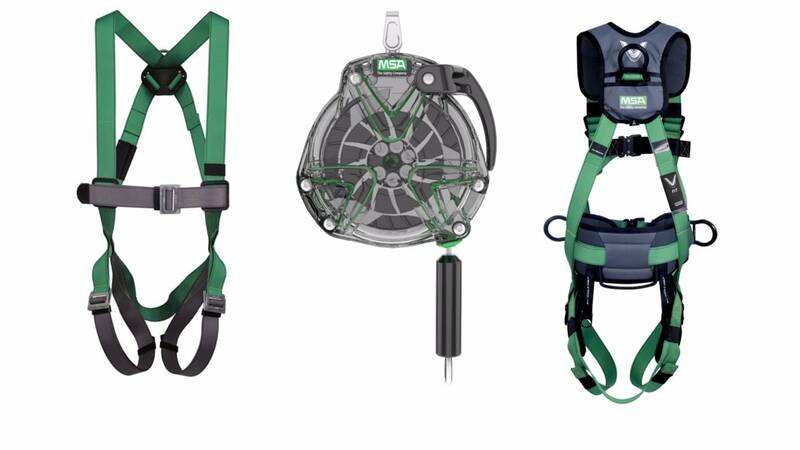 Both models feature fully adjustable straps, comfort features and dual load indicators to alert the user when the harness has been involved in a fall event. The V-FIT has shoulder and leg padding for increased comfort. The V-Range of Self Retracting Lifelines (SRLs) features the innovative engineering synonymous with MSA Safety fall protection, thanks to the New Product Development and Centre of Excellence in Devizes, Wiltshire. The V-TEC™ SRL features the award-winning design first seen on the Personal Fall Limiter with at-a-glance checking for peace of mind while the V-SHOCK has a rubberised casing for tough environments. A patented radial energy absorber to control energy is at the heart of every V SRL and additionally, the 6m version has a designed-in retraction dampener. This reduces retraction speed to eliminate any risk of the cable causing injury to the user or equipment. Customers can choose from a variety of lengths, in both stainless steel and galvanised versions, and each range will include a leading-edge variant. The V-TEC SRL’s radial energy absorber means safety is assured with zero calibration required prior to use. The MSA Safety V-FORM Harness, V-FIT Harness and V-TEC SRL range is available to purchase now. For further information, please contact your local MSA affiliate or visit MSAsafety.com.